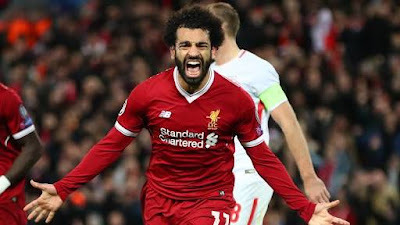 Mohamed Salah broke the record for the most goals in a 38-game Premier League season when he scored his 32nd of the campaign against Brighton at Anfield. Salah, who has now scored 44 goals in all competitions, scored Liverpool's first goal goal in the 26th minute as he turned sharply inside the box and fired into the bottom corner. Already the PFA Player of the Year and Football Writers' Association Player of the Year, Salah had been stuck on 31 goals since April 21, failing to get on the scoresheet against Stoke and Chelsea. But he has now claimed the record previously held jointly with Liverpool's Luis Suarez (2013-14), Manchester United's Cristiano Ronaldo (2007-08) and Blackburn Rovers' Alan Shearer (1995-96). However, he is short of the all-time goal-scoring record for the Premier League, as both Andrew Cole (1993-94) and Shearer (1994-95) plundered 34 goals in 42-game seasons. The goal also saw Salah claim a series of other records. He is now the all-time top-scoring foreign player in one season in Premier League history, going past Ronaldo and Suarez. And in netting against Brighton he became only the third player to score against 17 different opponents in one campaign. Arsenal's Ian Wright and Van Persie are the only other players to do this in a 38-game season. The goal was also Salah's 29th from inside the penalty area, which takes him past Robin van Persie's 28 notched with Arsenal in 2011-12. However, he is still three goals short of Ian Rush's record of 47 goals in all competitions in a single season for Liverpool during the 1983-84 season, and he will need to score in the Champions League final to match that.